Over the past two decades the world has become more peaceful. Today, rising pressures are generating increased conflict risk. We have learned a lot. Now, can we take advantage of that? Because we will need to. This is the second of a three-part horizon-scanning exercise. The first looked at the untold good news story of peace since the end of the Cold War and at ways in which the achievements of the period, though real, were limited. This post looks ahead to see what’s coming down the road at us, focussing on four big picture issues: demography, resources, inequalities and nature. The third ne will look at how risks cluster and ways in which that provides clues about how to respond. This is not conflict prediction but risk assessment. It’s not about which specific conflicts will explode in which places for what reasons, but about their backdrop – the systemic issues that create increased conflict risk. Or a confusing (for an outsider) amalgam of crime, politics and business. The elephant in the room in discussions like this is population. I suspect that many people who are likely to read this blog are also likely to shy away from a discussion of over-population. So rest assured, dear readers, that the issue is not just numbers. For at least the past 200 years, since Thomas Malthus’s Essay on the Principle of Population was proceeding through its six editions, there have been people arguing there’s too many of us already and any more means disaster. It hasn’t been true yet. The issues are demography, resource consumption and inequality. World population passed the 1 billion mark in 1810, doubled in the following hundred years, and another century on has risen to about 7 billion. The 2030 projection is 9 billion. After that, projections diverge between continued growth, adding 6 billion more by 2100, approximately steady state, and a modest decline. Where are we all to live? Today the world is 50% urbanised; that is, 3.5 billion people live in cities, which is a 115-fold increase over the past 200 years. Thus, world population goes up by a 100 million a year, and city population by 125 million. This is a demographic shift of wholly unprecedented scale. Some perspective comes from recognising that the migration from Europe to the new American world from the late 1870s until into the 1920s amounted to about 30 million people. Urbanisation per se is not necessarily a problem. Urban concentration is in many ways economically much more efficient than rural decentralisation. Cities of course have many problems but the growth of cities is also strongly and directly associated with growing literacy, a deepening culture, increased cooperation and social mobilisation for progress on political rights. But growing urbanisation is also associated with increased economic output, which also means increased consumption of natural resources. Natural resources got steadily cheaper throughout the 20th century, bar the occasional short-term spike in oil prices. And both the rich world’s growing economic wellbeing and successful cases of economic development such as South Korea were, in essence, predicated on that downward trend in the price of the basics. Prices declined because of greater efficiency in both the extraction and use of resources. Technological innovation is a part of the story; the West’s boundless determination to extract is also part of it. What needed to be done in order to keep the oil flowing and the mines working – whether by co-opting elites or through naked coercion – was always done. Resource Futures, a major 2012 report from the Chatham House think tank in London, foresees continuing increase in demand, and thus rising prices and competition between the major consumers, through till 2030 at least. The problem to focus on here is not whether there will be too few natural resources for the world population by 2030 or by 2100. The apocalyptic-ism of that kind of thinking is never helpful and under-estimates both human ingenuity and the influence of politics. Ingenuity identifies alternatives if and when stocks of a valued resource run low. And politics – how power is organised – is the means by which elites secure their own position while bearing down on the needs and consumption of the general population. Rather, focus on prices, difficulties of supply and increasing competition for resources at a level of abundance that modern economic functioning has come to need. And against that background, consider the different conditions in which people live. Last year, a panel set up by UN Secretary-General Ban Ki-moon and chaired by Indonesian President Yudhoyono, Liberian President Johnson Sirleaf and UK Prime Minister Cameron reported on world development after 2015. It has made the case that it is not only right but possible to eliminate extreme poverty by 2030. Extreme poverty is conventionally defined as living on less than US$1.25 a day (in 2005 prices). According to the World Bank, 1.22 billion people were living below that line in 2010, which meant the Millennium Development Goal of reducing by half the poverty rate in the least developed countries had been met. It is a big decrease in both the proportion of people living in that extreme poverty and in the absolute numbers – down from 1.9 billion in 1990. However, if the poverty line is just raised a little to $2 a day, which is hardly lavish, 2.6 billion people live below it, well over a third of the world’s population. 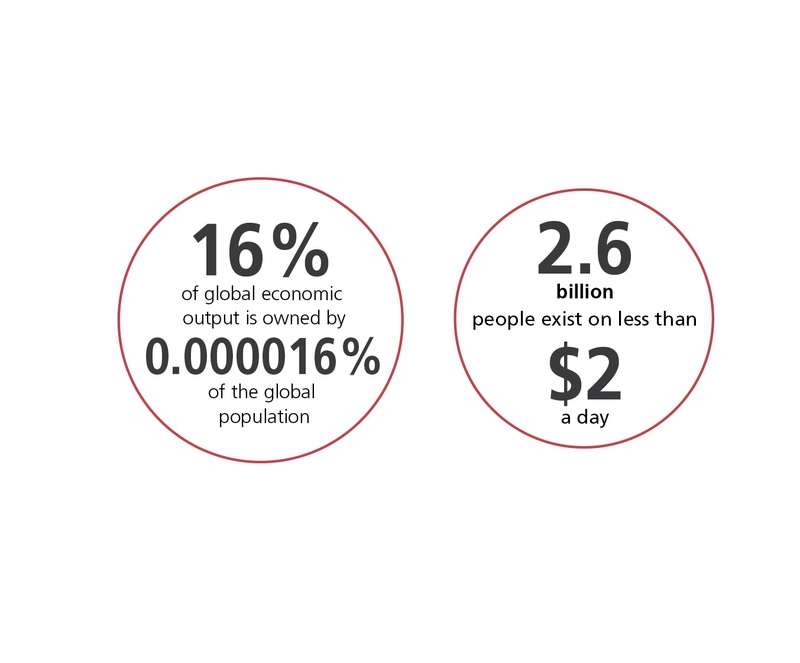 Thus while natural resources are consumed in abundance, over 35% of the world population is consuming very little. This issue is no longer the proselytising monopoly of the left; it is steadily becoming the staple diet of institutions with a social conscience from the Ford Foundation, via the World Economic Forum to the International Monetary Fund. Though it seems hard to pin down empirically, deepening inequality is widely viewed as one of the most worrying features of our age and has profound implications for prospects of peace and conflict. If the next decade and a half or so sees a successful effort at the $1.25 a day level, let’s try not to allow a rich-world commentariat to push the idea that poverty is history. Living on $2 a day is hardly non-poor and in any case it is not the absolute level of poverty but its relative level that destabilises societies – not the mere fact of poverty but the contrast with the wealthy. A recent Oxfam report calculated that the 85 richest people in the world own the same as the poorest 3.5 billion. There are bundles of other killer statistics to drive the message home. And countries where inequality is sharpest are also too often countries where that inequality both fuels and is fuelled by the root and branch corruption of the governing system. 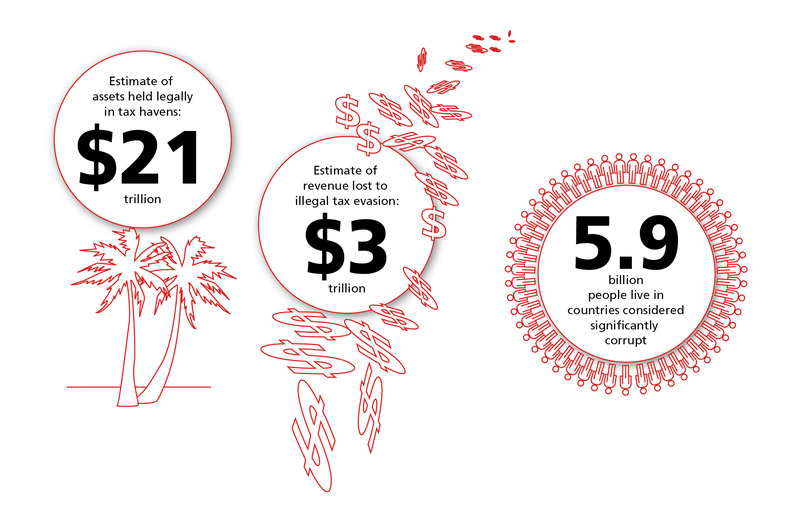 One small symptom of this is the scale of resources that are locked away from use for the common good through tax evasion and avoidance. The question for assessing conflict risk is what will happen if and when there is a day of accounting . For the past 20 years there has been a consensus that global policy on climate change should aim to keep the increase in average global temperature to less than 2 degrees centigrade above pre-industrial temperatures. Today, the 2 degree world seems a fading dream. There are no firm predictions but there are models and projections whose assumptions and methods are now getting empirical testing. The Inter-governmental Panel on Climate Change report last September estimated the range of temperature increase as 1.5 to 4 degrees centigrade; within that range, the models seem to be pointing at 3 degrees. Even if we slam on the brakes now, the consequences of yesterday’s greenhouse gas emissions will keep unfolding for two or three decades to come. The consequent changes in our natural environment will have social, economic and in many places political effects. The issue here is not about climate change causing war. There are still people arguing this case to and fro, including no less a luminary than Lord Stern, but the whole debate is beside the point. Whichever position is taken, this debate has a tendency to fixate on armed conflict defined as open armed conflict between two organised parties. These are real problems, of course, but are only part of the insecurity that people in many countries face. They are, however, easier to pin down for quantitative research than a morass of small conflicts, local violence and instability. And having reduced insecurity to conflict events, the next problem is that far too much of the discussion is about the relationship between this year’s conflict and last year’s weather. I am getting tired of it and it is no help for policy-makers. What challenges does climate change pose for a society? What capacity is there to respond (adaptability and resilience)? What happens if that capacity is insufficient to protect the common good? And what if the elite cannot even protect their own interests? As climate change continues, there will be more slow onset pressures such as droughts, shifts in the timing of the monsoon in parts of South and Southeast Asia, hotter summers and wetter winters in temperate zones. There will also be increasing frequency and severity of sudden shocks – the extreme weather events such as hurricanes, typhoons and cyclones. and natural resource supply chains. It is not that life will become impossible though some habitats will become functionally uninhabitable. Rather, these four strategic systems will become more vulnerable, more costly, and more complex. We know this to be true because it is already happening. Beyond this, there is the issue raised by the Stockholm Resilience Centre about what may happen as human activities transgress the planetary boundaries of sustainability, not just in climate change but in degradation of the biosphere, ocean acidification and six other critical areas. The key idea is that when we are in the safe zone, inside the circle, that’s the world we know. As we start to transgress the boundaries of sustainability, we get into unknown territory. 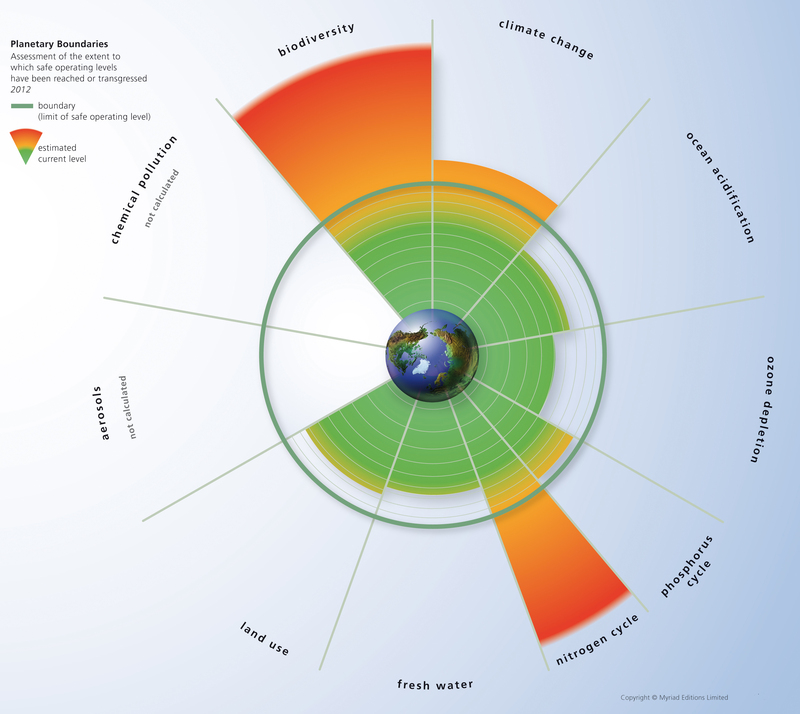 We don’t know what it’s like out there on the other side of the planetary boundaries. And in particular, we don’t know what happens if we cross all those frontiers. From the perspective of conflict risk assessment, what matters is the response. The challenge from nature is a challenge for governance and our social, economic and political institutions. As the basic conditions of life become more difficult, in those countries where inequality is greatest and conflict management institutions are weakest, the risk of conflict will be greatest. We have had good news for a couple of decades. But now we need to face up to much deeper challenges. My next post will look at the sort of the problems that may arise as a result of the pressures discussed here and how we can think about addressing them. * All graphics come from my State of the World Atlas (Oxford, New Internationalist & New York, Penguin, 2013). This entry was posted in Conflict & peace, International development, The State of the World and tagged Climate change, climate conflict, conflict risk, corruption, demography, inequalities, Inter-governmental Panel on Climate Change (IPCC), Malthus, Millennium Development Goals, natural resources, planetary boundaries, population, poverty, resilience, Stockholm Resilience Centre, tax evasion, urbanisation. Bookmark the permalink. A well balanced article. Most of the information which is provided to the general population is flawed, designed to make us dependent on the powers that be to “rescue” us from the situation we find ourselves in. I particularly like the rate at which the poverty level is measured. $1.25 is hardly a daily income to be “comfortable” on, but this measurement is taken so when poverty is reduced or eradicated, then they governments of the world can “pat themselves on the back” for a job well done.